Although the comic isn't necessary to enjoy the game, it (at least so far) fills in a lot of the back story. For instance, just how did Lex Luthor escape Brainiac at the end of the battle in the opening video to arrive at Watchtower in the past to speak to Superman, Batman and Wonder Woman? With only small parts of the larger story being revealed in the game once a month, Legends seems to be filling in the story that isn't seen. 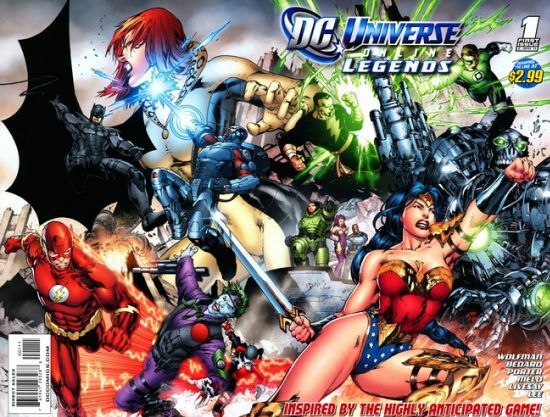 The plot of the game appears to be outside of the normal DC Universe comics continuity (again, so far) so the comic follows that story and not regular DC comics. With both of the current videos from the game available on Youtube HERE and HERE, even fans without access to the game can enjoy the expanded story in the comic. The story picks up at the end of the opening game video, which was the extended trailer months ago when the heroes and villains of the DC Universe went toe to toe in a final battle that cost the lives of many on both sides. Lex Luthor finally killed Superman on the battle field with a Kryptonite spear, touting how the Man of Steel was killed by an ordinary man. Captain Cold appears out of the rubble claiming that Superman needs to survive and that he can freeze his body to be revived later. But Luthor screams, "NEVER!" and kills Captain Cold with a shot to the head, spouting, "Superman will NOT live again!" As Luthor goes on about how he destroyed this alien menace, Brainiac's ships appear overhead, now unhampered by Earth's heroes, they unleash exobytes all over the planet, infecting all of humanity. Lex informs Brainiac's hologram that the robots that Luthor created using Brainiac's specifications are ready to be activated and Lex is ready to take over the planet. But Brainiac reneges on his end of the deal and tells Lex that once all life on the planet has been eradicated, that all of Earth's information will be stored in his computer banks and Earth will be deleted. 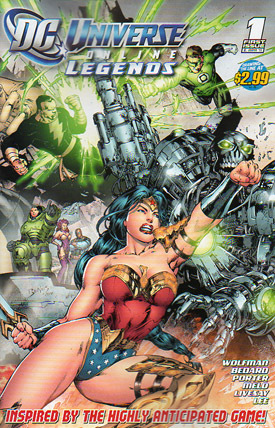 Brainiac takes control of Luthor's power armor, but Lex manages to hack past the computers and regain partial control. Luthor finds Black Adam barely alive in the rubble of Metropolis, but Adam knows he's dying. Luthor fights Brainiac's orders to finish off Black Adam, but begs him to say his magic word, hoping that a lightning strike will short out his suit's systems and allow him regain full control. Black Adam obliges so Lex's plan works and he regains control and fends off Brainiac's robots. Now in human form, Adam says the word again, but nothing happens as he realizes that his other self has died. No longer any use to Lex, he allows the robots to finish off Adam's human form. Lex runs to his Lexcorp offices and escapes in a pod created for just such an emergency. FLASH BACK to seven years ago when Metropolis was still standing. Luthor's board meeting is interrupted by an emergency call about a problem in "Laboratory K," Luthor's off-the-grid computer in Antarctica that stores information about all the meta-humans on Earth. A robot the size of a flea is downloading all the information and the technicians can't seem to stop it. 57 minutes later, Luthor arrives at the lab and wonders how this tiny robot worked its way into this facility which was designed to keep out the likes of Batman, The Atom and even Oracle. Brainiac speaks to him through the computers and suggests they work together to finally destroy Superman. He claims that if left unchecked, that Superman will adversely affect the course of human evolution, which is what Lex has feared all along. Without Superman, all of Earth's other heroes will fall into place. IN THE FUTURE AGAIN, Luthor lands his escape pod in the desert outside a hidden telecommunications station that only he ever knew existed and that lays outside the satellite grid, so even Brainiac wouldn't know of it. He speaks out to the people of Earth all over the globe and asks for all the heroes and villains to help him take down Brainiac. The Atom is the first to respond, by riding the comm-signal back to its source. They begin rounding up surviving heroes and villains. Luthor and The Atom greet Blue Beetle, Doctor Fate, Black Canary, Powergirl, Solomon Grundy, Mister Freeze and August General so they can begin their plans to save the world. Story - 4: It certainly helps to have seen the opening video of the game to understand what's happening in this issue. Enough is explained and even elaborated on so that it's not entirely necessary. But again, it helps. Without seeing the video, there's no reason to read the expansion of the back story, so I highly recommend checking that out before reading the issue. Here's a Lex Luthor who fights against Superman because he believes the Man of Steel is holding back humankind. 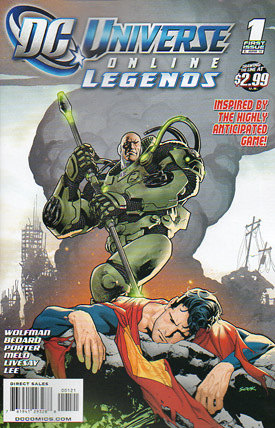 In Luthor's mind, he's the hero of this story who was betrayed by Brainiac. In past continuities, Lex has fought against Superman for a number of reasons, but some of the most effective villains both in the out of non-fictional history have believed they were right, instead of simply wanting to do evil things for evil's sake, or for personal gain. This Lex does evil things, including alluding to how he killed the construction crew of his secret communications station so that he would be the only one alive who knew of its existence. And that boils down to an evil act that he believed served a greater purpose, which in turn sets up a powerful logic behind an evil genius villain. One of the most powerful moments in the issue was when he begged for Black Adam's help to regain the control of his cyber suit, then allowed Adam to die because he was no longer useful. Again, he has the betterment of society in mind, but without the humanity of Superman who would have saved a life. My hope is that the second semi-monthly issue will complete this part of the story instead of rambling on for six full issues about this one small part of the initial back story. Then perhaps more of the comic plot can revolve around the world in which the game itself takes place and perhaps even play off more of the expansions in the game world. Again, only time will tell. Art - 4: With a few exceptions, the art holds up well. It's unfair to compare it to the computer generated videos from the game. Sadly, it lacks the scope of a decimated Metropolis in the backgrounds. Several pages take place there, but between panel layouts, the smoke and the swarming exobytes, there's never a good moment to take in how badly the city has been damaged. While that may in some ways be realistic, I expected more. The characters mostly look great, but I especially liked the work in the flashback sequence. Faces look much better closer up then farther away. Lex's horrific expressions to Brainiac's attack on the already beleaguered city said a lot about his character and motivations. He'll kill someone if it serves a purpose and he'll allow someone to die if he's not in a position to save him, but he's seeing needless, purposeless death and these clear facial expressions say a lot about who he is and what he's feeling in those moments. Cover Art - 3: I almost graded this a 2, until I realized that it was a wraparound cover. The back actually looks better than the front. Sadly Superman is missing, but he wasn't in the part of the video that this is depicting anyway. The background characters on the front show far less detail than the ones on the back. Cover Art (Variant Edition) - 4: I've always believed that variants should be at least slightly better than the regular covers and this one succeeds. Luthor and Superman both look crisp and clear. There's glowing Kryptonite in the foreground reflecting off Superman's fingers. The background is hazy, but powerful. It looks like a war was fought and Luthor is plunging his victory "flag" into what was once enemy territory, i.e. Superman himself. 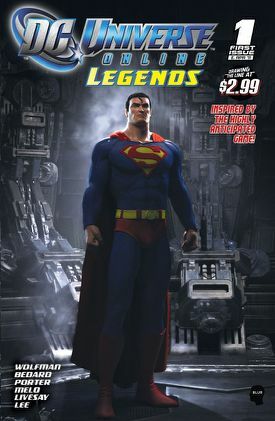 Cover Art (Digital Edition) - 3: This appears to be a screen shot version of the digital Superman from the CG parts of the game while he's on Brainiac's ship. If you've played the game, whenever you create a new character, you test him or her out on the ship before heading to Metropolis or Gotham. This appears to be the room where your mentor, who may be Superman, steps in to help you out for the first time. I still find this version of Superman wooden and unfeeling, even in this powerful neutral stance. The lighting/shadowing effects are pretty outstanding though. I expect this is the only digital cover we'll see him on, at least for a while. My guess is that the next five issues will have similar covers featuring (in no particular order) Batman, Wonder Woman, Lex Luthor, Joker and Circe. Again, we'll see.